Eine besonders nette Aufgabe fÃƒÆ’Ã‚Â¼r Tag 19 – eine Brief an Santa zu schreiben! Ist ziemlich lange her, daÃƒÆ’Ã…Â¸ ich das gemacht habe – nun eigentlich war es auch eher das Christkind als der Weihnachtsmann – LOL! 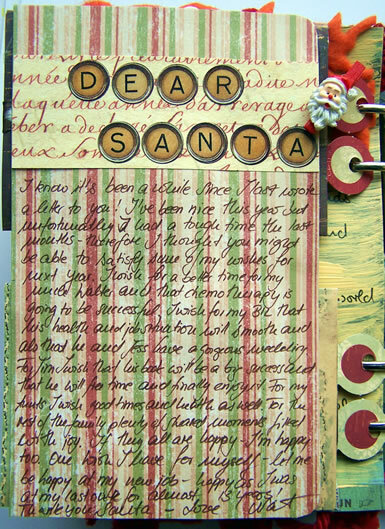 A really nice task for day 19 – a letter to Santa! Definetly a few years passed since I last did this – well actually I did write letters to the christkind and not Santa as a child – LOL! Danke fÃƒÆ’Ã‚Â¼rs Schauen – thanks for looking! Ich wÃƒÆ’Ã‚Â¼nsche Euch allen einen wunderbaren Tag – I wish you all a gorgeous day! How can Santa refuse your wishes now? What a cute letter! Your journal is such a treat! Love how you did your title and you have such NICE handwriting! Lovely!!!! so cute, this is going to be one great album !